Identification: This sea hare has a bright yellow body decorated with pale blue and bright orange ocelli. Occasionally it may have faint brown spots. 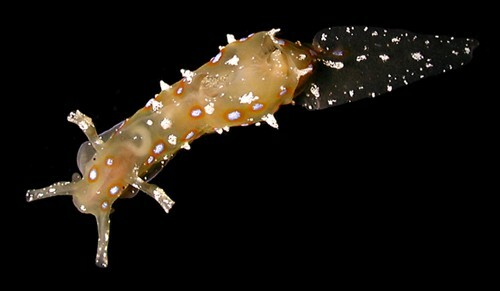 The "tail" is elongate and flattened. Distribution: Big Island, Maui, Oahu, French Frigate Shoals and Kure: circumtropical. Taxonomic notes: First recorded in Hawaii from a lobster larvae collector at Kure by Scott Johnson on June 16, 1980. Photo: CP: 2006 CREEF expedition; French Frigate Shoals; Oct. 25, 2006.